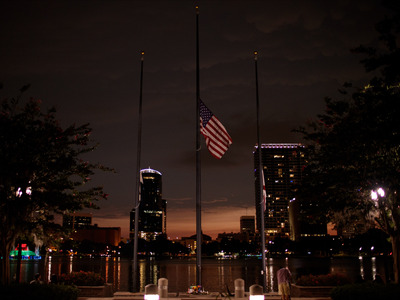 Getty Images/Drew AngererA flag flies at half mast in Orlando, Florida. Following Sunday’s mass shooting at an Orlando nightclub, President Obama ordered all public and military buildings to lower flags to half mast. Many non-governmental businesses and buildings have followed suit. But one Washington woman noticed that not all the flags near her hometown were lowered. She decided to do something to change that. KT Treadwell recently stopped by a United Rentals outlet in Tukwila, Washington, The Stranger reports. Treadwell, who identifies as genderqueer, felt hurt that the business hadn’t lowered its flag in response to the attack, which occurred at a gay nightclub. She then asked the workers to lower the flag. Treadwell then embarked on a one-woman campaign. She spent the rest of her day stopping by businesses that had not lowered their flags, including a construction equipment company, car dealerships, and storage facilities. She proved impressively persuasive. Treadwell said that, by Tuesday afternoon, only one business she approached had not lowered its flag: A Taco Bell where workers said they didn’t have the authority to do so.